Air with a Mini DisplayPort to conventional DVI displays, such as CRT, LCD monitors and projectors. 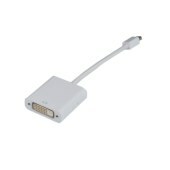 Supports Mini DisplayPort1.2 and 4 lanes. Support Mini DisplayPort 1.2a input andDVIoutput. Support HDMI highest video resolution 1920x1080@60HZ. Supports multiple color format: RGB 6/8/10/12-bit per component (bpc) and YCbCr4:4:4, YCbCr4:2:2,8/10/12bpc. HDMI 1.4b compliant with maximum data rate 3.0Gbps. Supports 10/12-bit deep color 1080p up to 2.25Gbps. Content protection of HDCP Rx and Tx keys to support HDCP repeater. Integrated both HDCP Rx and Tx keys to support HDCP repeater.